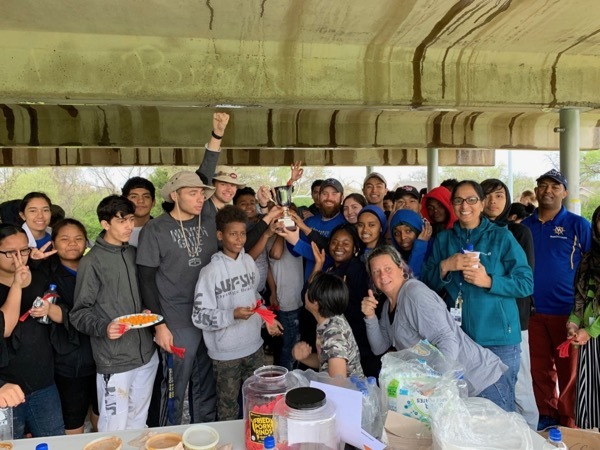 Volunteer Debonie Enge, center in navy, and Groundwork Dallas COO Aaryaman Singhal, to her right, led student teams at the Environmental League's Conservation Cup at Harry Moss Park on March 23. Photos courtesy of Jim Lord. A Dallas nonprofit has come up with a creative way to enlist teens to clean up a park. The third annual Conservation Cup at Harry Moss Park in Dallas was hosted by the Environmental League of Dallas on Saturday. 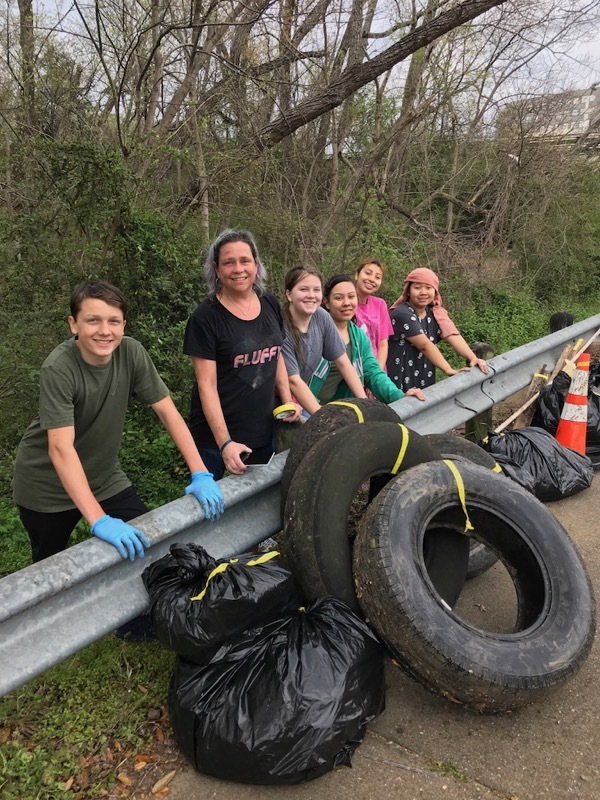 During the event, teens from three Dallas high schools and one middle school vied to see who could clean up the most trash in the 284-acre park. Trash is an ongoing problem for the park says, Jim Lord, founder of the Environmental League of Dallas. Volunteer Kim Parize, second from left, and her student team display trash pulled from the woods at Harry Moss Park. Harry Moss Park features a 6-mile mountain bike trail, managed by the Dallas Off Road Bicycle Association, along the banks of White Rock Creek. The creek floods, with water rising up to 9 feet at times, depositing litter from upstream. A regular runner on the Harry Moss trails, Lord launched the Environmental League two years ago, in part, to tackle the park’s litter problem. Since then, chapters have been formed at two high schools, with two chapters in the works. Students learn about environmental issues, participate in outdoor activities and volunteer in the community. Lord envisions the program as a way to foster teens’ connection to nature and create a pipeline from high school to local environmental groups, who often struggle to attract young members. The Environmental League’s positive influence on local youth is evident. At the Saturday event, more than 60 students from Hillcrest, Emmett J. Conrad, W.T. White and Benjamin Franklin Middle School split into teams and scoured the park. After 90 minutes, they picked up more than 100 50-gallon bags - not including dozens of large dumped items. 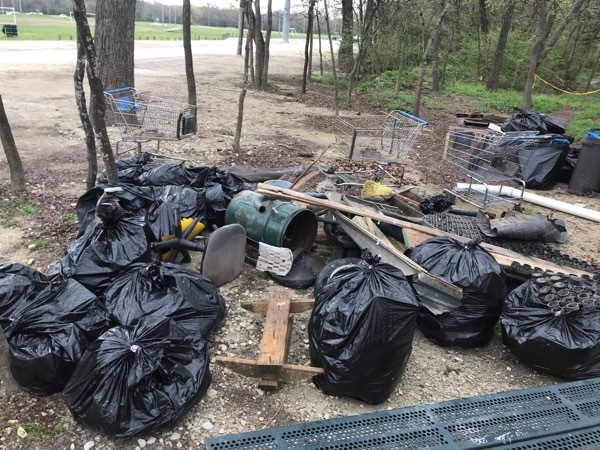 Grocery carts were among the large items found dumped at the wooded park. In addition to the usual cups, plastic bags and cans, the teens and their adult team leaders hauled in 12 tires, five grocery carts, four large barrels, PVC pipe, a chair, a couch and three mattresses. Conrad High took home the trophy this year, beating rival Hillcrest by just one bag. The school dropped off its 37th bag just as the closing horn sounded. Lord admitted there was still trash to be found. On May 11, they’ll take another sweep during the Environmental League's second annual Trash Dash 5K. At last year’s inaugural race, runners filled 65 50-gallon bags by dropping off litter at 12 stations located along the route. Lord said unfortunately, the job of litter pickup is never done. Students from Conrad High School with Coach Andrew McCorkindale, in blue shirt, beard and cap, hold up trophy after winning the Conservation Cup.